The hardest thing to describe about wildlife in the Galápagos is how the animals are so naive. It’s something you really have to experience to fully understand. On land there are no large predators. 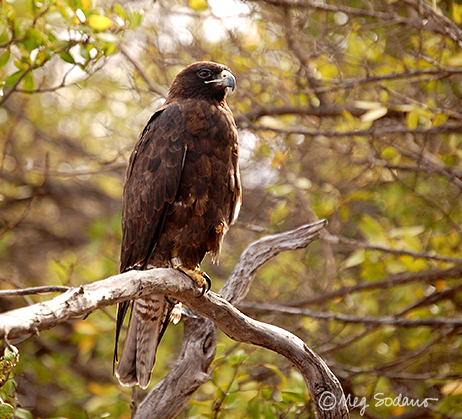 The Galápagos hawk (right) is the top predator, and it feeds on the eggs and young of birds and reptiles, and also on adult finches, lava lizards, and some insects. So the animals do not fear humans, and therefore we are able to observe all their behaviors up close. It is a special privilege to witness their struggles to raise young, find food, and survive in an extreme, isolated environment. ▲ The rituals of courtship and raising young are in plain view. Top row: Male blue-footed boobies flash their vibrant webbed feet and lift their wings out and up in a “skypointing” display. A male Nazca booby repeatedly collects twigs and pebbles, then gracefully marches to the nest to present them to his female. Middle row: Swallow-tailed gulls, who mate for life, are incredibly attentive to their partners, lying close and preening each other gently. The waved albatrosses preen each other nicely too. Their elaborate courtship song-and-dance is also quite amazing to watch! Bottom row: Mother sea lions and their newborn pups are a common site in September. Some pups, just days old, wait patiently (or not so patiently) for mama to return from fishing. Some mother sea lions, still recovering from giving birth, nurse their newborns in the sand right next to the humans’ walking trail. Lastly, a Pacific green sea turtle has come ashore to lay her eggs in the soft sand during the night. She left at dawn, before we arrived, but we can study her path through the sand and be in awe of what has taken place. ▲ While I’m on the subject of baby animals… It is fascinating to watch any baby animal learning about its world, practicing its language and locomotion. Above are some of the best baby animal pics I snapped. (Hover over an image for the caption to appear.) I want to point out the cormorants in the third row. The photo on the left was taken in Week 1. The middle photo is of the same two chicks with their mother, and it was taken in Week 3 when I revisited their nest on Fernandina. They were as big as mama! ▲ Injury and death cannot be ignored when you have to step around or over them. Left to right: Mummified carcasses of marine iguanas are everywhere on the lava rocks at Punta Espinosa (Fernandina). They are a reminder that many marine iguanas died during the last El Niño event in 2015. Warmer water temperatures prevents their sole food source, green algae, from growing. Drastic changes in water temperature can be disastrous to the population, sometimes causing 60% of the iguanas to die of starvation. Next, an orphaned red-billed tropic bird waits helplessly in its nest. Its mother recently fell prey to a short-eared owl and what’s left, just feathers, lies in the dirt a few feet away. A skeleton of a Bryde’s whale has been arranged near the trail by park rangers. A young sea lion, recently bitten by a shark, cleans its wound and tries to keep the annoying flies away. Our guides were optimistic about its survival, but still, encountering this beautiful animal in such distress was heartbreaking. ▲ 11 species of Galápagos Giant Tortoise inhabit the islands. On Santa Cruz there are farmlands where wild tortoises come and go, depending on the season, and it is possible for humans to get up close. Being near them in their wild, green landscape offers some unforgettable moments. Listen and watch. You can hear them breathing, pulling plants from the ground, eating. They can live over 150 years. Imagine what these creatures have seen in their lifetimes – what they have overcome! ▲ Meet the lizards of Galápagos. Charles Darwin famously called the marine iguanas “imps of darkness” and showed no shame in the fact that he disrespectfully and repeatedly flung them into the ocean by their tails. He had no idea of their significance then. The evolutionary stories of all the lizards are fascinating. And I think their textures and colors are spectacular. The islands are home to the marine iguana, 3 species of land iguanas, and 7 species of lava lizards. 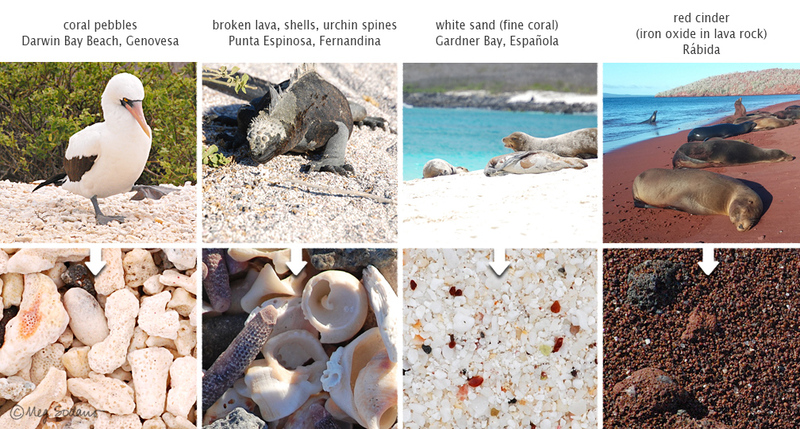 Top row: Marine iguanas from Fernandina and Española. Notice their snouts are blunt compared to the land iguanas. This allows them to grasp seaweed from the rocks underwater. Middle row: Land iguanas have more vibrant colors, are much larger, don’t swim, and have pointier snouts. Here are some from Isabela and South Plaza Island. Bottom row: Lava lizards are small enough to hold in your hand, but obviously that’s not permitted. These are from Española, Sombrero Chino, and Fernandina. Individuals with red color on the throat are females. ▲ Watch where you’re walking! Seriously, sometimes the animals are right in the path – booby nests, piles of marine iguanas, newborn sea lions – and you could easily step right on them if you’re not paying attention. Another reason to look at the ground is to notice what the ground is made up of. White sands are made of coral. Black sands of shells and broken bits of lava. Observing these differences gave me a new perspective on the geology of my surroundings. The composition of beach sands can vary widely from one island to another. I visited black, red, white, golden, and even “green” sand (with tiny green crystals) beaches. ▲ The lava flow on Santiago was created during an eruption in 1897. It’s a striking and barren landscape. There are only a few pioneer plants here (mainly lava cactus) and maybe a few birds. But the patterns and textures you can see on a late-afternoon walk are a photographer’s dream! They tell the story of how the lava spread over the island, flowing slowly and forming rope-like patterns as it cooled. ▲ For you map-lovers out there, here are the paths of the two itineraries we took. Galápagos National Park requires that when a tour boat visits a site (beach/trail/snorkeling site) it cannot return to that exact spot until at least 2 weeks later, hence the alternating weekly itineraries. 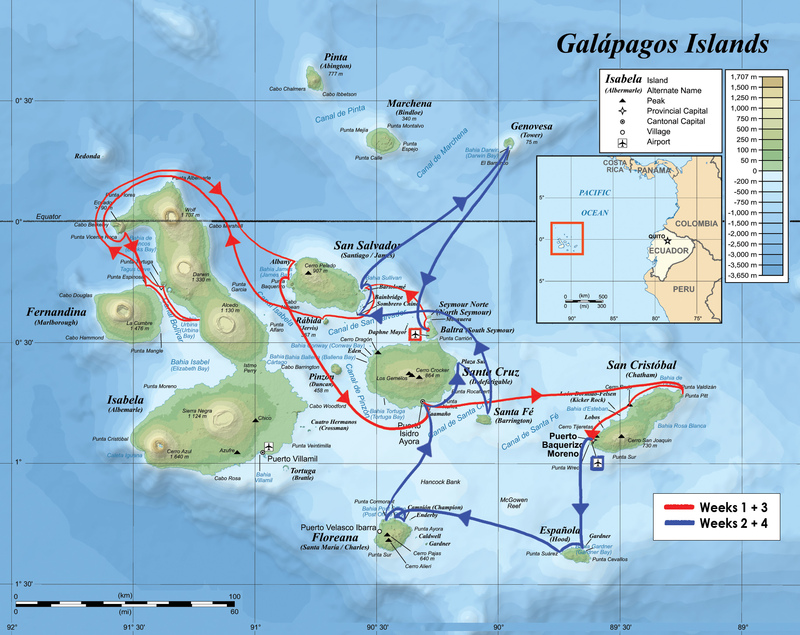 The “western” itinerary (red) begins at Baltra and ends at San Cristóbal. This trip reaches the youngest islands, including Fernandina, and allows visitors to see the flightless cormorants. The “isolated islands” itinerary (blue) starts at San Cristóbal and ends in Baltra, hopping to distant and unique places, with an opportunity to see the waved albatrosses on Española. To conclude, I would like to acknowledge my hosts… The fact that I traveled with Lindblad Expeditions – National Geographic made it possible for me to experience the environments and wildlife of Galápagos with awareness. The naturalist guides on all four expeditions were incredible. I learned different things from each of them – they have years of guiding experience and a wealth of knowledge about cultural history, geology, biology, ecology, climate, and even astronomy. They talk about current conservation efforts and research. They speak multiple languages. They passionately share personal stories of life in the islands and encourage guests aboard the ships to support conservation initiatives in Galápagos. Over the last two decades, Lindblad Expeditions and its guests have donated over $6.7 million towards conservation projects run by Galápagos National Park and the Charles Darwin Research Station. I think that’s awesome. It’s a big responsibility to take tourists into such a fragile ecosystem. I think Lindblad and its staff are doing it right, and I hope to travel with them again in the future.